In the September issue, Ambassador Marc Grossman explores an evolving concept of diplomacy to meet the opportunities and challenges America faces in A Diplomacy for the 21st Century: Back to the Future? During 29 years in the Foreign Service, Grossman, a career ambassador, held many high-level positions at the Department of State including undersecretary for political affairs, assistant secretary for Europe, ambassador to Turkey and, most recently, as U.S. Special Representative for Afghanistan and Pakistan. 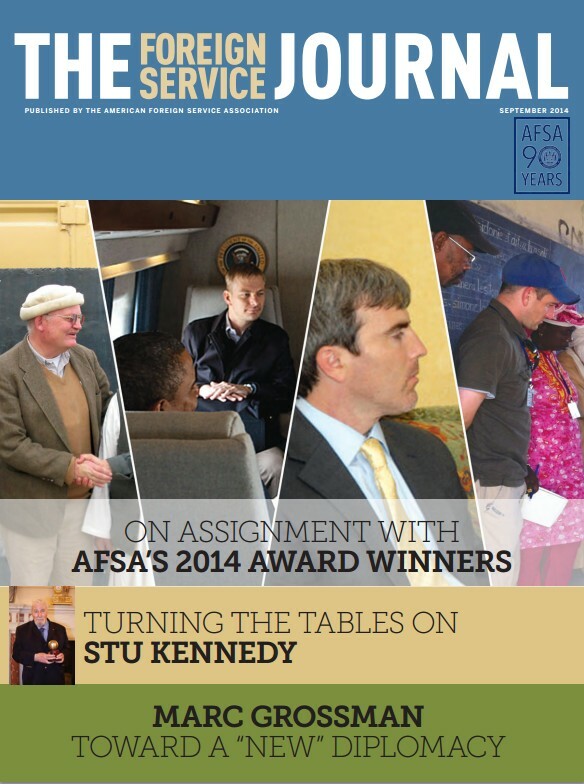 The issue’s focus is on AFSA’s 2014 award winners. Charles Stuart Kennedy, recipient of the Lifetime Contributions to American Diplomacy award, discusses his Foreign Service career and his pioneering work on American diplomacy’s oral history program with FSJ Editor Shawn Dorman. Ambassador Jonathan Addleton, recipient of AFSA’s Herter Award for constructive dissent by a senior FSO, reflects on his experience in Kandahar. Retired FSO and three-time AFSA dissent award winner Ambassador Kenneth Quinn shares his thoughts on Requirements for an Effective Foreign Service, drawing on his 32 years in the Foreign Service. Complete coverage of the 2014 awards ceremony, including profiles of all of the dissent and performance winners, is featured in the AFSA News section of the magazine. Elsewhere in the issue, FSO William Bent shares his experiences of life at the U.S. embassy in Kabul, and AFSA President Robert Silverman shares thoughts on advocating for the Foreign Service. A Diplomacy for the 21st Century: Back to the Future? A distinguished diplomat explores an evolving concept of diplomacy to meet the kaleidoscope of opportunities and challenges America faces. Charles Stuart Kennedy, 2014 winner of AFSA’s Lifetime Contributions to American Diplomacy Award, talks about his Foreign Service career and pioneering work creating American diplomacy’s oral history program. Honesty and candor have been the watchwords of this three-time AFSA dissent award winner’s diplomatic career. When Washington quashed a local outreach effort in Kandahar, one FSO decided to throw a spotlight on a broader public affairs problem. Life on a secure compound in a war zone is somewhat surreal.